When heading to the Orlando, Florida area, Disney Springs is the perfect destination to add to your list. 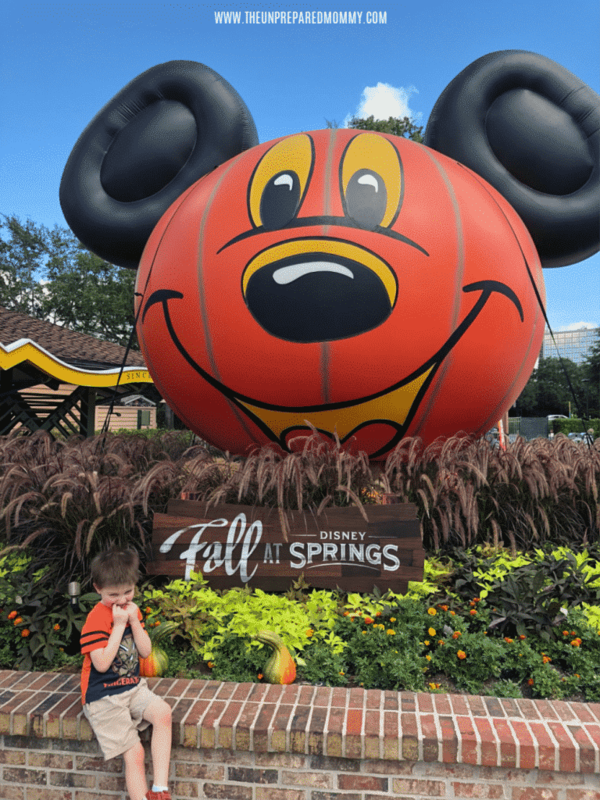 Disney Springs offers offers all sorts of family friendly attractions, so you have the chance to relax, refuel, and enjoy some excellent Disney magic. If you are heading to Disney Springs soon, look below at these 7 inexpensive activities to enjoy at Disney Springs, so you can make the most of your visit no matter what your budget may be. 1. Let kids run through the bubbles. Bubble vendors are all around the park, and they are always excited to show off their bubble blowing devices! The nice thing is you don’t even need to purchase anything, you can just let kids enjoy the massive amounts of bubbles floating in the air! 2. Listen to some live music. Disney Springs features some of the best musical acts in the area! Settle in a shady spot or enjoy one of the seating areas and listen to live music for hours. Enjoy everything from rock, to bluegrass, to pop hits at no extra charge. 3. Watch the famous Disney candy apples be made. When you are walking through the streets of Disney Springs, be sure to stop at the candy apple shop and peak in the viewing window. You can watch as candy apples are dipped and decorated, and you don’t need to buy a thing. Do you like collecting Disney pins? While you are at Disney Springs, don’t hesitate to trade those pins with other Disney cast members. They will be able to chat with you, talk about your collection, and even trade you pins so you can collect some new ones. 5. Enjoy the volcano show! Every hour, Rainforest Cafe puts on quite a show for all to see! Keep your eyes on the volcano outside of the restaurant where some loud rumbling is followed by a fiery eruption. This is a fun site for kids to see. 6. Play with the Legos. 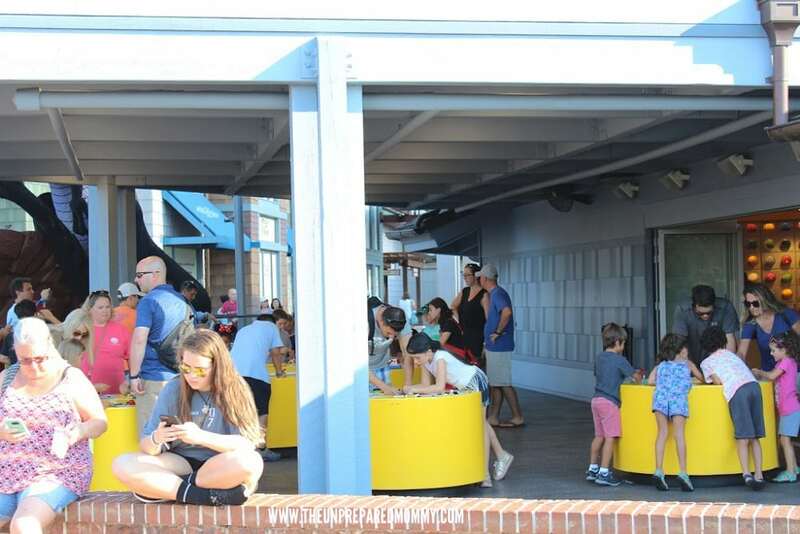 Head to the Lego store where kids can play in the Lego bins for free. You can also take part in free building events and even make your own Lego race car to race. The best part is, there is no charge to play or participate in these attractions. 7. Take advantage of the photo opps. 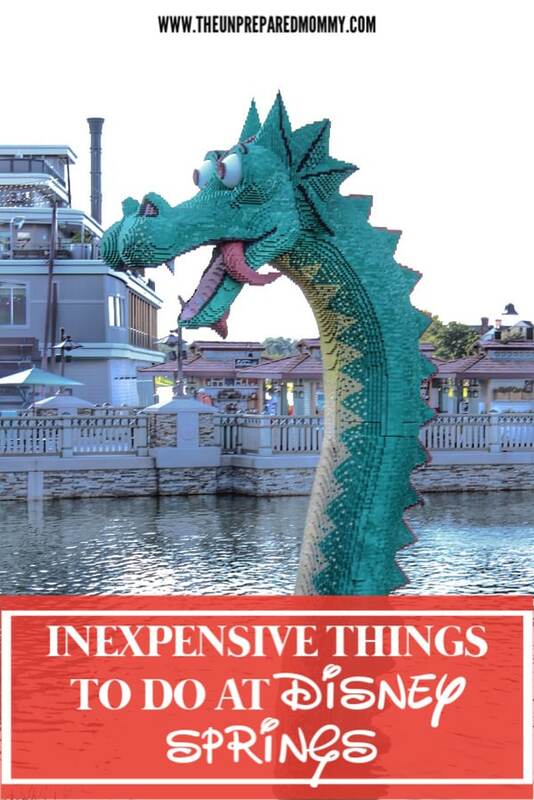 All through Disney Springs you can find photo props perfect for taking memorable pics. You will find statues of your favorite characters, fun signs, and other decorative set ups ideal for snapping the perfect pic. Should you still want some more fun and cheap things to do while visiting Disney Springs, don’t forget to check out the carousel which you can ride for just a few bucks per person. You can also enjoy ice cream treats for just a few bucks, and watch the live street acts and presentations at no charge. If you are in the Orlando area, be sure to check out these 7 inexpensive things to do at Disney Springs and make your travel dollar go further. Awesome, I have never heard of Disney Springs, but it will be on included in my next trip.